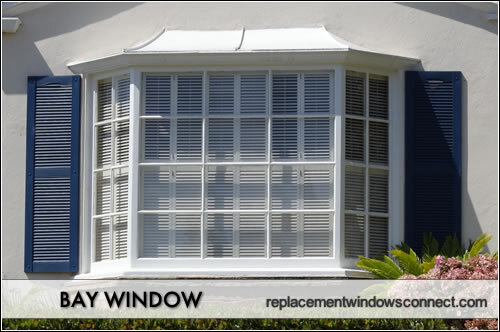 Expect bay window prices to range from $1100 to $3900 installed, definitely at the top end of the pricing spectrum. Bays consist of three large paneled windows that are mulled together to create a bay or alcove for kitchen sitting areas, living room reading nooks or places to take in the views outside the home. They are a wonderful choice to add a wonderful focal point to a room and look stunning from the outside. A basic bay will consist of 3 non-opening fixed frames that are mulled together. They are often vinyl frames and will be available in a limited number of colors and hardware. Entry level options usually use standard glass package. A standard bay window will have still have 3 large frames mulled together. A standard bay can either use wood or vinyl windows, with wood being the more expensive route and requiring more upkeep over the years. At this mid range level, you may begin to see some variation in the available styles such as casements or single hungs on one of the side panels. Window glass may be low-E or may be argon filled. Premium bays are going to use aluminum, fiberglass or wood clad frames (or clad options on any of these materials) that are mulled together. Almost always they will use single-hung, double-hung or casements on one or two of the side frames to allow for a breeze and easier exterior cleaning. High end options will usually use nice glass options such as low-e, insulated and argon fills using double or triple paned glass. In addition, there will often be a larger color and high end features available. Bay window prices for installation range from $500 to $1500. The cost of installation can be kept to a minimum if the replacements are roughly the same size as the current frame size. If the opening has to be made larger, you can expect the window costs to increase significantly. This includes the install and all materials. Companies that may offer a good option at this price include Great Lakes, Reliabilt and MI. This includes the install and all materials. Companies that may offer a good option at this price include Anlin, Harvey and Okna. This includes the install and all materials. Companies that may offer a good option at this price include Loewen, Marvin and Andersen.